As if the modern Canadian bride didn't have enough things to consider when planning her wedding, it seems that once one decision has been made, several others pop up in its place! 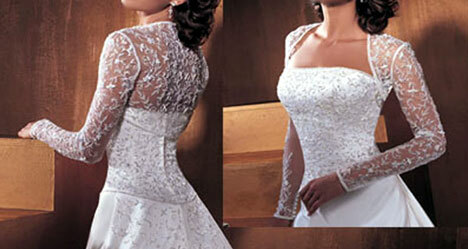 For example: you've decided which style of wedding dress you want - but now you have to select the fabric. The fabric you choose for your wedding day fashion statement will affect the movement, fit, and feel of your gown, so there are lots of factors to consider. For example, if you're planning a destination wedding or otherwise outdoor wedding in warm weather, lightweight materials such as chiffon, light satin or crepe are breezier than materials such as velvet, satin, or crinoline, which are better for winter bridal gowns. The following alphabetic fabric guide gives a bit of background information on some of the most common fabrics used for wedding gowns. A sheer, delicate, and plain-woven fabric; batiste is similar to, but slightly thicker than cotton. With it's "home-made" look and transluscent texture, batiste projects a rather Victorian image. Crepe is a gauzy, silk fabric with a crinkly surface. It creates a lightweight gown with great draping qualities. Like Brocade, Damask features raised, woven designs; however it is lighter than Brocade. This fabric is less expensive than pure silk and regular satin. With its light blend of rayon and silk, it's perfect for gowns with added details such as embroidery or heavy beading. Sometimes known as "Rough Thai Silk", this 100% silk fabric is lightweight and similar to shantung; however its finish is thicker and coarse and also carries a subtle sheen. Often used to make coats and pants, gabardine is a tough fabric with a tight weave and diagonal lines across the surface. Georgette is a sheer, light fabric made out of silk or polyester with a crepe surface. 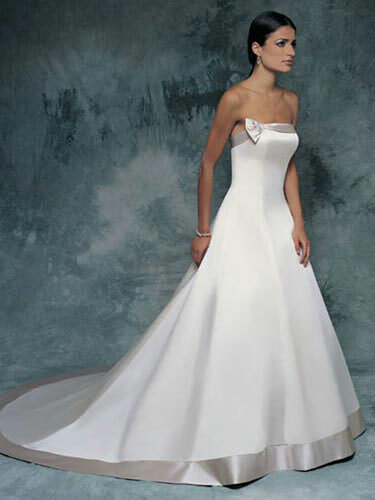 It is often used as a top layer on wedding dresses due to its wonderful draping quality. Traditionally, this openwork fabric was made by hand, and therefore a more expensive option amongst fabrics. Today, lace can be made by machine, and can even be made with stretch or "give" incorporated into the fabric. 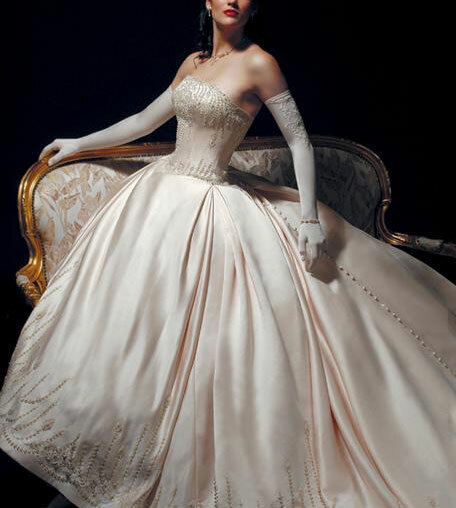 Organza is a gauzy, stiff fabric made from silk or synthetic material. Silk Gazar is also a four-ply type of organza. French for "skin of silk," Peau de Soie is a synthetic or silk fabric with a matte finish. Polyester often gets a bad rap due to its synthetic qualities, but it can also be woven into different materials to resemble other fabrics and lend its durable properties. Silk threads that are densely woven together create the shiny, firmer fabric known as satin. One possible drawback for a wedding gown sewn with satin is that this fabric hugs every curve - so be sure your dress isn't too tight to begin with. This plain-woven cotton or silk fabric has a rough texture, lines, and more of a matte finish than a sheen. It is also known for having beautiful draping properties. A lustrous and natural fiber, silk has fabulous draping qualities, and its threads may be woven together to create a plethora of other fabrics, such as regular satin and duchesse satin, chiffon, charmeuse, dupioni, shantung, organza, and tulle. A crisp, rustling fabric, taffeta may come in either a matte or lustrous finish. 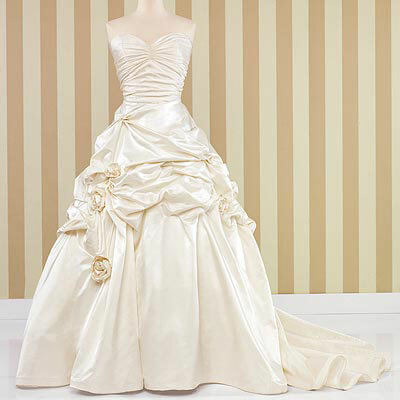 Made from silk or synthetic fibers, Taffeta is the perfect choice for a wedding dress with a full skirt. Another type of Taffeta, called "Moire Taffeta," features subtle, wavy lines throughout the fabric. Most people are familiar with velvet's soft-pile, luxurious feel. This fabric is perfect for a winter wedding due to its weight and drape.